This volume provides a unique primary source on the history and philosophy of mathematics and science from the mediaeval Arab world. The fourth volume of A History of Arabic Sciences and Mathematics is complemented by three preceding volumes which focused on infinitesimal determinations and other chapters of classical mathematics. 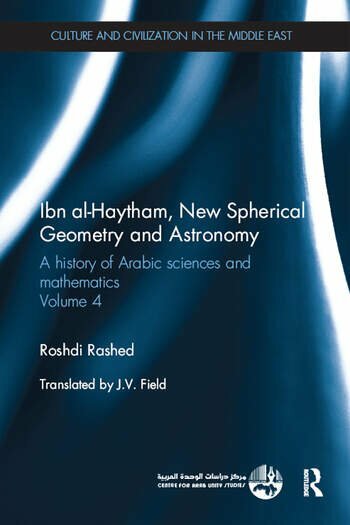 This book includes five main works of the polymath Ibn al-Haytham (Alhazen) on astronomy, spherical geometry and trigonometry, plane trigonometry and studies of astronomical instruments on hour lines, horizontal sundials and compasses for great circles. the study on astronomical instruments and its impact on mathematical research. These new historical materials and their mathematical and historical commentaries contribute to rewriting the history of mathematical astronomy and mathematics from the 11th century on. Including extensive commentary from one of the world’s foremost authorities on the subject, this fundamental text is essential reading for historians and mathematicians at the most advanced levels of research. Roshdi Rashed is one of the most eminent authorities on Arabic mathematics and the exact sciences. A historian and philosopher of mathematics and science and a highly celebrated epistemologist, he is currently Emeritus Research Director (distinguished class) at the Centre National de la Recherche Scientifique (CNRS) in Paris, and is the former Director of the Centre for History of Medieval Science and Philosophy at the University of Paris (Denis Diderot, Paris VII). He also holds an Honorary Professorship at the University of Tokyo and an Emeritus Professorship at the University of Mansourah in Egypt. J. V. Field is a historian of science, and is a Visiting Research Fellow in the Department of History of Art and Screen Media, Birkbeck, University of London, UK.